A preterm male neonate, weighing 1,350 g was delivered at our center to a 25-year-old primigravida at the 32nd gestational week. The mother did not have any history of connective tissue disorder, smoking, alcohol abuse, or substance abuse. On initial physical examination, the neonate had bradycardia (50–55 beats/min), grunting, subcostal retraction, and cyanosis and, therefore, was intubated and mechanical ventilation and surfactant therapy were initiated. 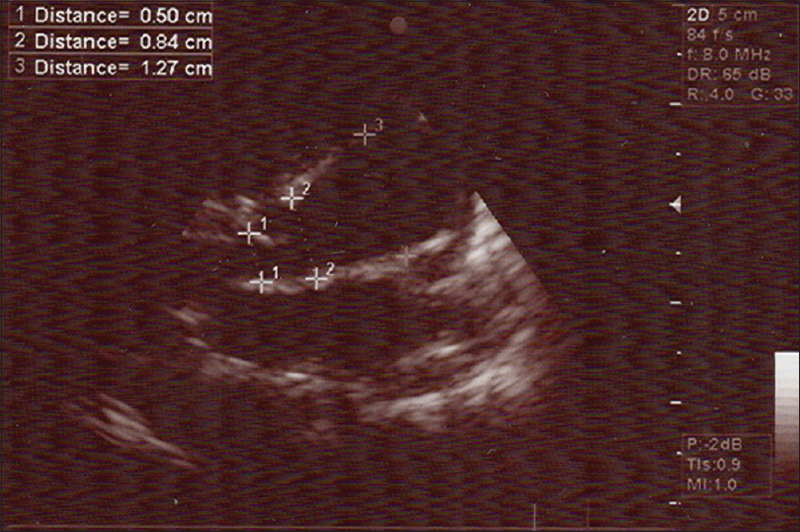 Cardiac examination revealed grade III/VI systolic murmur and electrocardiogram showed complete heart block (CHB). 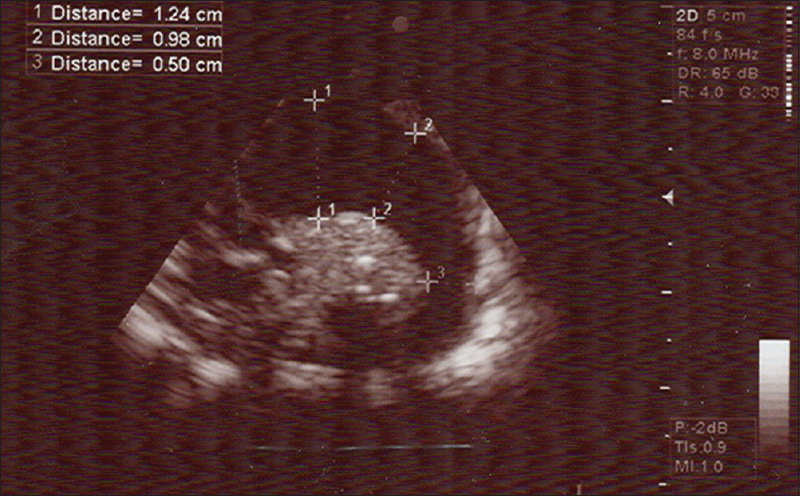 On the second postnatal day, echocardiography showed patent ductus arteriosus (PDA), and dilatation of the ascending aorta and the aortic arch [Figure 1] and [Figure 2] without any structural abnormalities or effusions. The patient received ibuprofen and isoproterenol for treatment of the PDA and bradycardia, respectively. The mother underwent rheumatologic investigations that showed positive serum anti-double stranded deoxyribonucleic acid (anti-dsDNA) and anti-Ro/Sjögren's-syndrome-related antigen A (anti-Ro/SSA) antibodies, thus, the diagnosis of neonatal lupus erythematosus (NLE) was made. Isoproterenol was discontinued gradually, while the heart rate remained at 60–65 beats/min. The patient was followed with serial echocardiographic studies that showed the progression of aortic dilatation over time and persistent bradycardia. Therefore, after 1 month, the infant was referred for inserting a dual-chamber pacemaker. After normalizing the cardiac rhythm on follow-up echocardiographic studies, the progression of aortic dilatation disappeared and interestingly, the aortic diameters gradually regressed. Wahren-Herlenius M, Sonesson SE. Specificity and effector mechanisms of autoantibodies in congenital heart block. Curr Opin Immunol 2006;18:690-6. Radbill AE, Brown DW, Lacro RV, Cecchin F, Berul CI, Triedman JK, et al. Ascending aortic dilation in patients with congenital complete heart block. Heart Rhythm 2008;5:1704-8. Davey DL, Bratton SL, Bradley DJ, Yetman AT. Relation of maternal anti-Ro/La antibodies to aortic dilation in patients with congenital complete heart block. Am J Cardiol 2011;108:561-4. Altit G, Sarquella-Brugada G, Dahdah N, Dallaire F, Carceller AM, Abadir S, et al. Effect of dual-chamber pacemaker implantation on aortic dilatation in patients with congenital heart block. Am J Cardiol 2014;114:1573-7.